(It’s pretty cheesy, but) Seize the moment! There have been a couple of times I’ve hesitated before grasping some of the great opportunities that have presented themselves during my first semester, but the answer should always be: YES! For example, I was desperate for the toilet after driving from Binghamton to New York City (approx. 3 hours) before travelling home for Christmas. 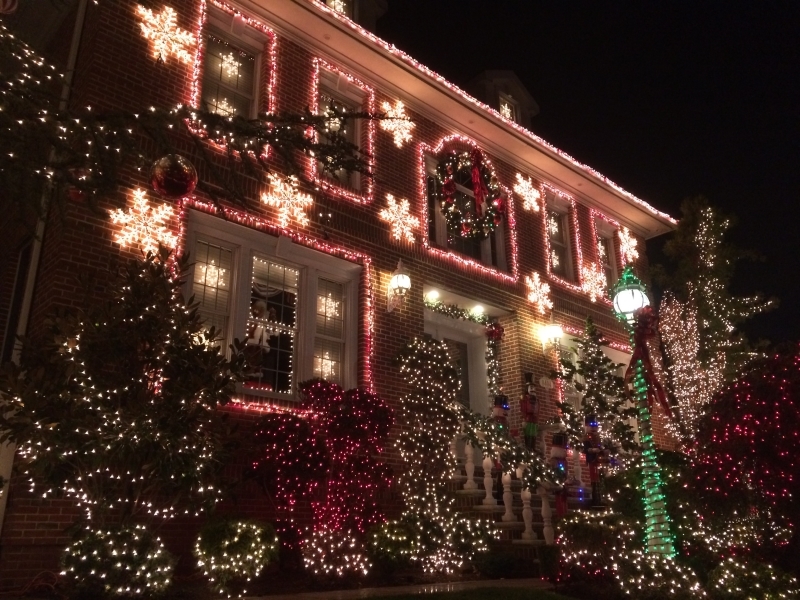 I had the choice of going straight to the hotel to relieve myself or to take the half hour drive to Brooklyn to see the famously ostentatious Christmas lights at Dyker Heights, which incidentally was one of the things on my USA bucket list. I am so glad I said “yes” to going to see them! I found myself running around, squealing like a little kid because they were just so christmassy! (And so much more impressive than in the UK!). Honestly, it hadn’t felt at all like there was less than a week to go until Christmas day until I was walking around this brightly twinkling neighbourhood. The following day I had decided to tolerate the long subway journey into Manhattan, do some last minute shopping in Times Square and to see the Christmas tree at the Rockefeller Centre. Stupidly, I forgot to take my umbrella and I wasn’t wearing a hooded coat so, surprise surprise, it absolutely chucked it down with rain! I got so soaked that when I popped into Starbucks to use the wi-fi I actually formed a puddle on the floor around me. It would have been easy enough to just give up at this point and go back to my hotel but instead I got in contact with a couple of my friends from the exchange programme who had mentioned they would be in the city too and together we braved the pouring rain to walk about 15 blocks to the Christmas tree; it was so, so worth it! 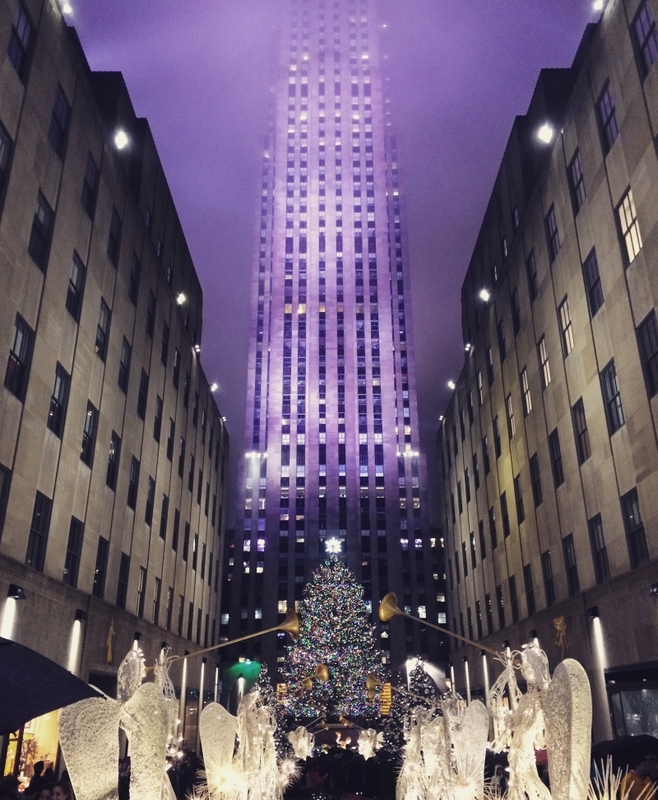 Miraculously, the rain even let up for a while when we reached the tree and the mist the weather had created around the top of the Rockefeller building gave the whole place a magical purple glow. Pardon the cliché but it may have been a once in a lifetime opportunity, I may never find myself in New York at Christmas again so I couldn’t be more pleased that I said “yes” to visiting the tree. My advice to you for your year abroad is that even if you are feeling tired or lazy, or you really need the toilet, or even if you are worried about money, just take advantage of the amazing opportunity you have and get out there and see the sights because this could be the best chance you will ever have to do so!